Public sessions offer anyone and everyone a fantastic opportunity to experience the thrill of ice skating for the first time, or to perfect your skills. 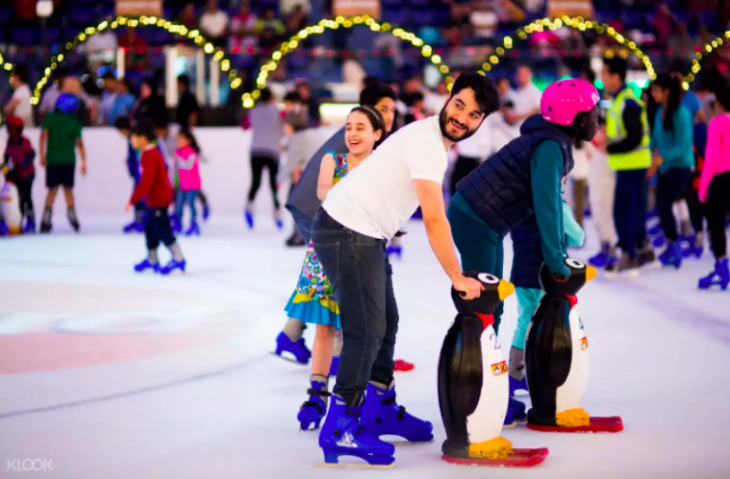 Exclusively in the country at Dubai Ice Rink, IceBykes are located in a dedicated area of the rink safely away from skaters. They glide seamlessly across the ice for a fun new way to experience both ice skating and cycling at the same time. Try first IceBykes in the region! Got the coolest moves on ice? Then you’ll love Disco Sessions, when the resident DJ spins his tunes, from hip-hop and electronic to dance and modern pop. A cool light display gets you in the mood to show your skills, so bring your friends along and get in the groove! Freestyle is a figure skating discipline and a level of achievement in ice skating. A freestyle session is a practice session for the more advanced skater. Freestyle skaters can use this session to perfect their jumps, spins and footwork. They can also play their music routines to prepare for competitions and shows. Dubai Ice Rink Skating Academy is committed to support the development of Figure skating within the UAE and provide ample opportunities and access to the ice for skaters of this caliber. Dubai Snowfall - Experience A White Winter All-year Round. When soft flakes fall gently around you and when fresh flurries make your feet and fingers glow. That’s magic! Visit Dubai Ice Rink, the only place where snow falls in Dubai. For non-skating events, Dubai Ice Rink transforms into a fantastic arena that can accommodate hundreds of guests. Here, you can witness unique events round-the-year including the live action of the Emirates Hockey League, Dubai Ice Hockey Challenge Cup, Dubai Golden Cup and Table Tennis Championship, Dubai Fitness Championship, Magical Dubai Snowfest or join hundreds of eager fans to watch the big-screen excitement of events such as the FIFA World Cup. Mon–Thu 10:00–23:45, Fri–Sat 09:00–23:45, Sun 10:00–23:45.